Sebastian Skube from Bjerringbro-Silkeborg knows how difficult it is to play in Veszprem. He expects a very tough game for the Danish champions when they visit on Saturday. 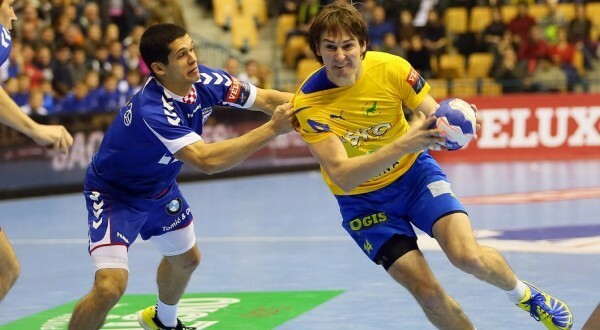 The Slovenian playmaker of Bjerringbro-Silkeborg, Sebastian Skube, scored seven goals last time he visited Veszprem. With his former club of RK Celje, he was millimeters from making quite a big upset back in 2013 but in the last seconds, Celje missed a penalty and the chance to draw. Instead, Telekom Veszprem won like many time before and since on the dreaded home court. The home court Veszprem Arena that was awarded best home court in the VELUX EHF Champions League earlier this season. – I have played in Veszprem quite a few times. It is a very hard place to play. There is a very intense crowd and Veszprem is one of the strongest teams in the world, said Sebastian Skube, before he once again visit Veszprem Arena when Bjerringbro-Silkeborg play Telekom Veszprem in the VELUX EHF Champions League on Saturday. – There is a huge difference between playing in Veszprem and playing in Denmark. I Denmark there is a little group of supporters among the spectators, while 5.000 people in red shirts cheer on their team in Veszprem, told Sebastian Skube, who as Slovenian know the special Balkan atmosphere very well. The Danish champions of Bjerringbro-Silkeborg is highly underrated against Telekom Veszprem, who have reached the VELUX EHF Champions League final in the last two seasons. The fact, that Telekom Veszprem have no less than 11 newcomers while only two players left the club before this season, tells the story about one of the strongest squads in the world with world class players like Momir Ilic, Aron Palmarsson and Laszlo Nagy in front. Telekom Veszprem has almost 30 skilled players in their squad and any Danish club would be lucky just to own number 20 and 21 in the Veszprem-hierarchy. – They have a great team. They have over 20 players on an international level with a lot of experience. It is a team without weak spots, said Skube. So it would be a huge surprise if you win in Veszprem? – If anybody wins in Veszprem, it is a surprise. Bjerringbro-Silkeborg travel to Hungary with high heads after a win on Wednesday against TTH Holstebro. The Danish champions was down by 20-13 at half time against the team they beat in last season’s final in the Danish Championship, but in a crazy second half Bjerringbro-Silkeborg managed to turn the game around and win by 34-33. – It was an important win for us yesterday but we have many things to learn. We have to be mentally prepared and it is not enough just to play well in the second half, when we play in the VELUX EHF Champions League. Usually, we play on a high and stabile level and we need to do that again on Saturday, told the only non-Danish player in the Bjerringbro-Silkeborg squad. – In order to have just a small chance to win in Veszprem, all of us need to play a very good game and at the same time, Veszprem shall have a bad game. We do not hoist the white flag. We will fight for the upset but it will be very difficult for us. Throw off between Telekom Veszprem and Bjerringbro-Silkeborg is Saturday afternoon at 17.00. The game will be live on DR3 Denmark, Sport 1 Hungary and EHFTV.com. Next Story → RK Vardar score 40 against champions from Kielce!